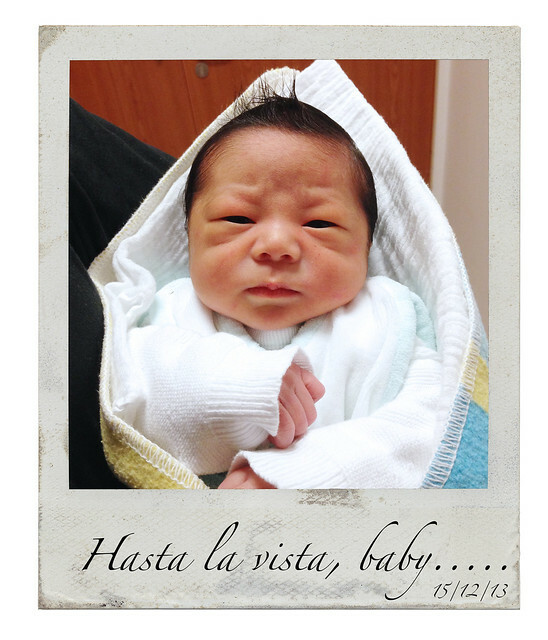 I have been MIA for awhile as I was preparing for the birth of our first child. It has been a love hate relationship between me and my pregnancy. I love that I am blessed with child but I hated the weight I have gained. I never felt more clumsy and fat in my whole life. However, all is good, I know I can lose the pregnancy weight now that our baby is born. 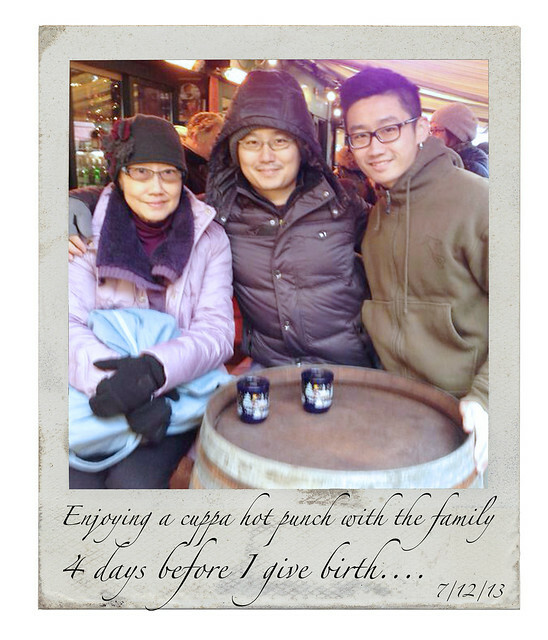 My husband's whole family flew 10++ hours to visit us in Europe to bear witness to the birth of our baby boy. For that I am grateful for the support and love, even though the duration of their trip was short. I am truly appreciative of their efforts. 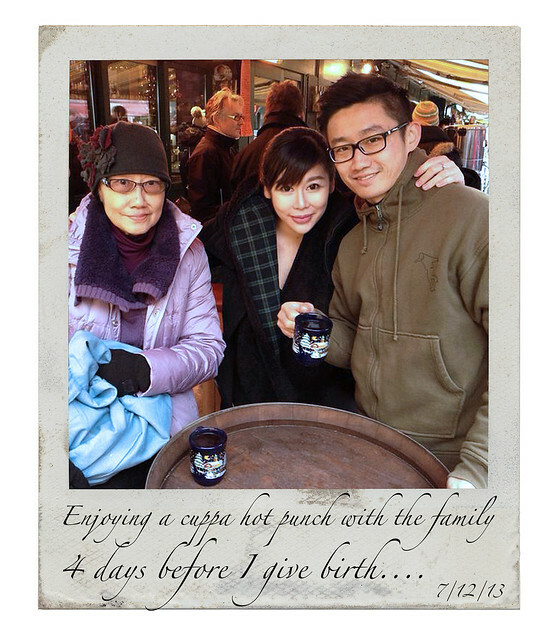 7 Dec 2013 - We brought the family around and this was taken 4 days before I gave birth. Pic with my mother-in-law & dearest hubby. I had a relatively easy pregnancy. 7 Dec 2013 - Mother-in-law, hubby and his brother. 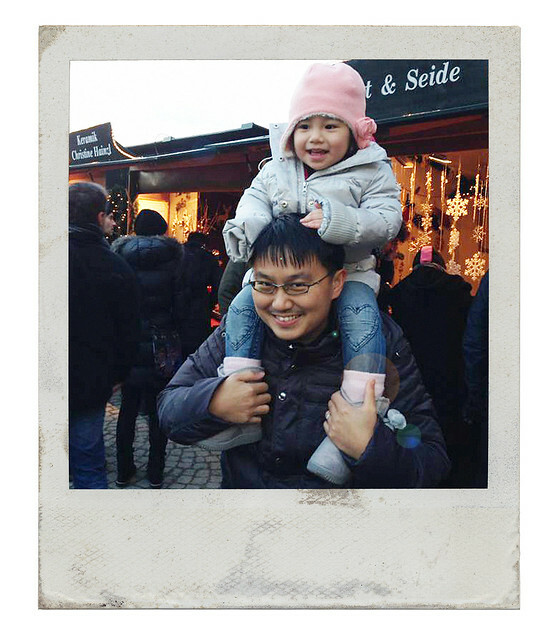 having a ride of her life on her daddy's shoulders. 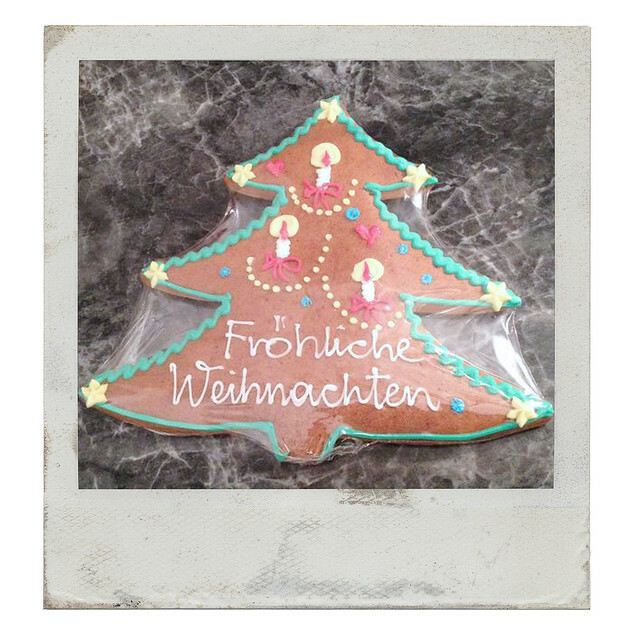 8 Dec 2013 - Bought gingerbread cookies at the Christmas Markets that we visited. 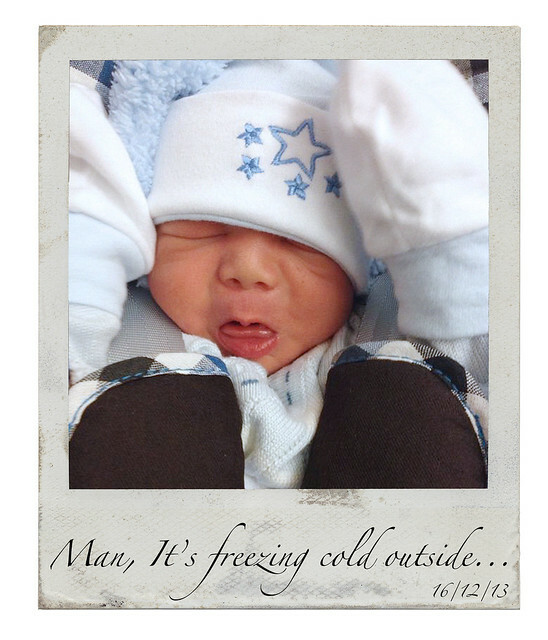 11 Dec 2013 - Shortly after Baby Raedon is born. My sister-in-law, niece, mother-in-law and hubby. 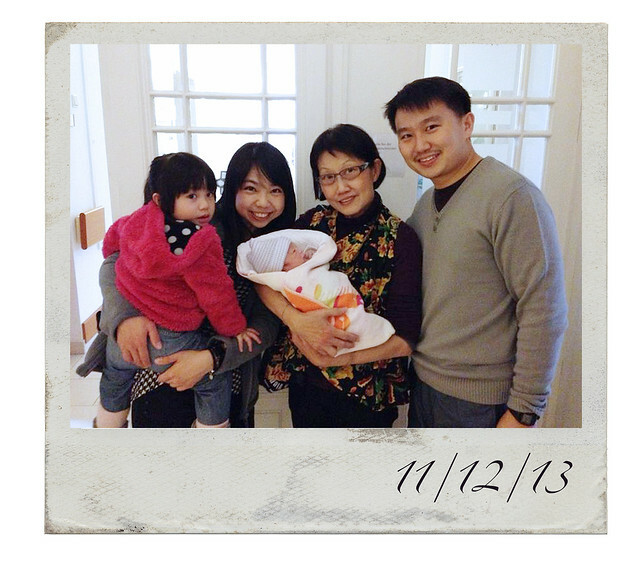 11 Dec 2013 - Another photo with the family. with the newest addition to the family. 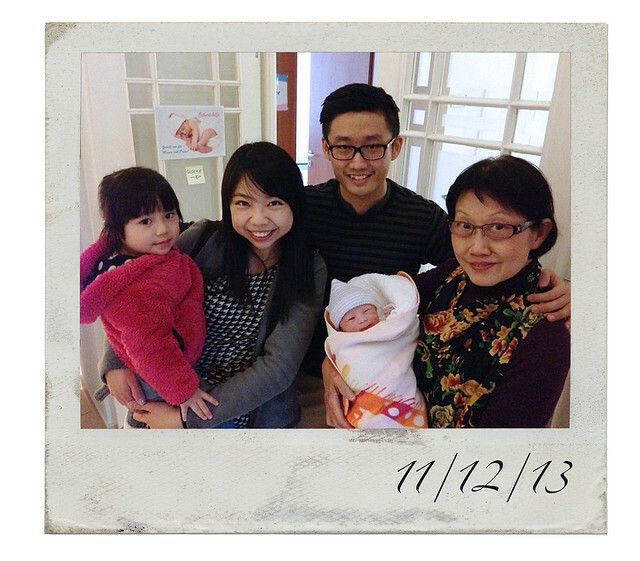 11 Dec 2013 - Hubby receiving Baby Raedon from the nurse who helped in the operating theatre. and brought Baby Raedon up to my face for me to see. Baby Raedon weighed 2950 grams at birth and measured 50cm. So far, I have lost 6kg in 7 days. about my choice of elective c-section. I have to be honest and say that I chose 11/12/13 because we truly liked the date. so I do not see why I should cater to anyone else's opinions of how I should give birth. Giving birth is hard and complicated. We all have something valuable to bring to the conversation about giving birth and even about raising children, even if what we bring is wildly different than what the person beside us brings. The important thing is to listen and be supportive when someone else talks, not to judge and condemn them for doing it differently. I, for one, prefer to try to be the support instead of being the one to judge. I am blessed because I have a supportive husband and family who flew all the way to Europe to see the birth of our son.... even if it was just for 7 days. Everyday I count my blessings! 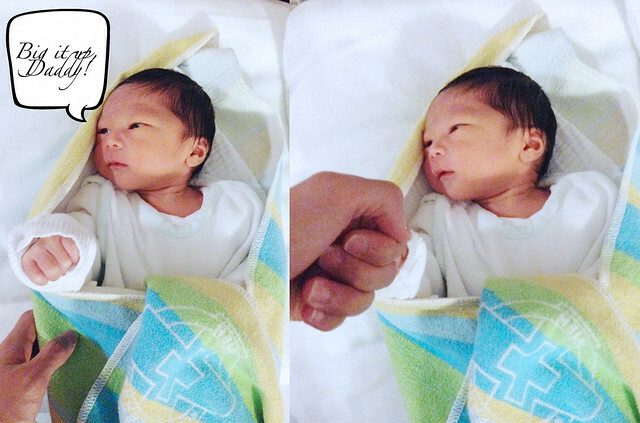 14 Dec 2013 - Baby Raedon spending quality time with his daddy. 15 Dec 2013 - "But there's a story behind everything. But behind all your stories is always your mother's story, because hers is where yours begin." 15 Dec 2013 - Baby Raedon after a bath lesson with his daddy at the hospital. recorded the entire event. lololol...... Thumbs up for the good work, daddy! Baby Raedon was born with a head full of hair and the hairstyle of the day is Mohawk! 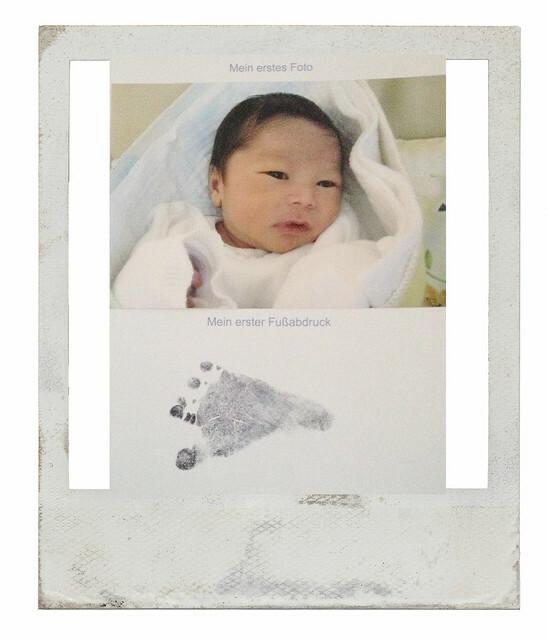 16 Dec 2013 - The hospital took his foot print and a photo of him to give to us. 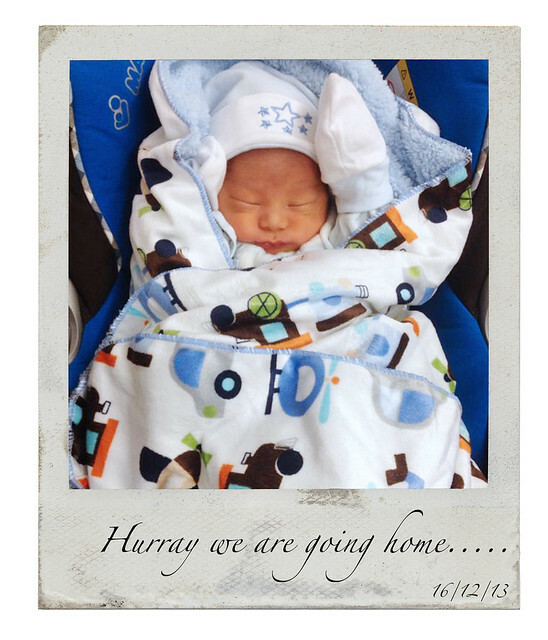 16 Dec 2013 - We are packing up and preparing to leave the hospital. Baby Raedon asleep in the car seat. the quinny buzz. We have 2 interchangable seats in one stroller. 16 Dec 2013 - Yay we are finally discharged. I stayed at the hospital for 6 days 5 nights. 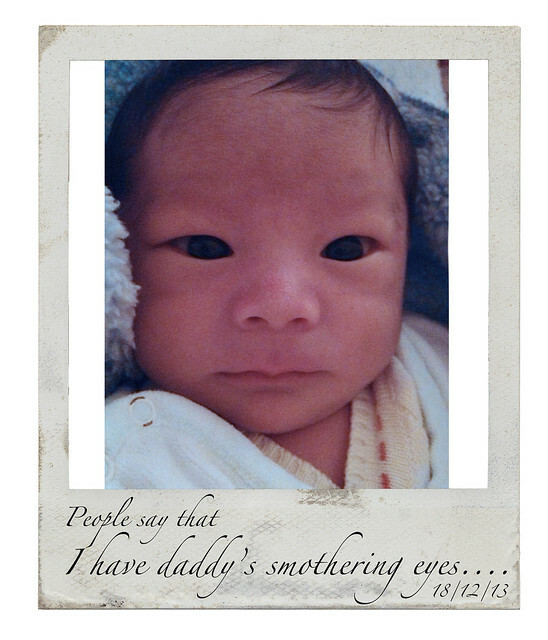 My c-section stitches was removed on 16 Dec 2013.
and Baby Raedon is snuggled warmly in his blankie. 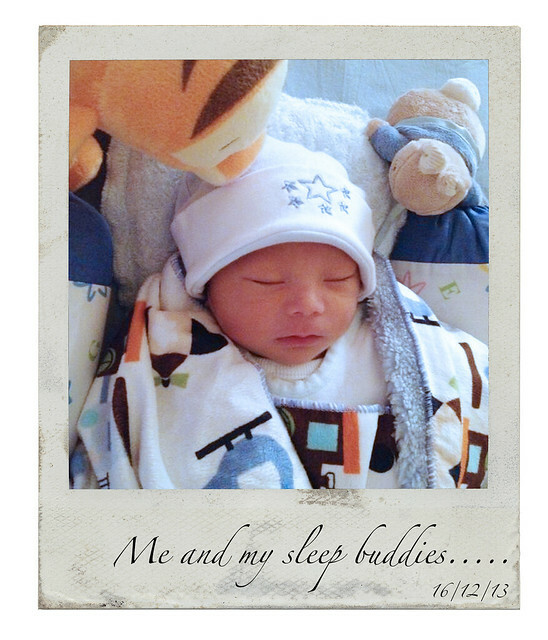 16 Dec 2013 - Finally we reached home and Baby Raedon was still fast asleep. We put him into bed with his 2 sleep buddies. 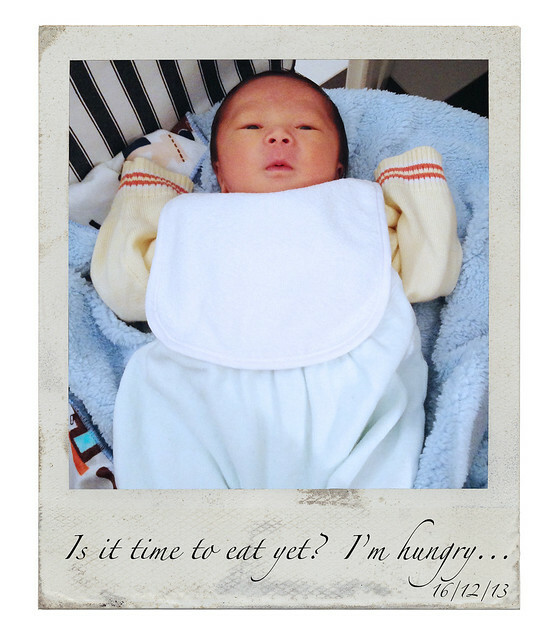 16 Dec 2013 - He woke up 3 hours after we arrived home, hungry and ready for his milk! your implants are under the muscle. My breast augmentation was done under the muscle. 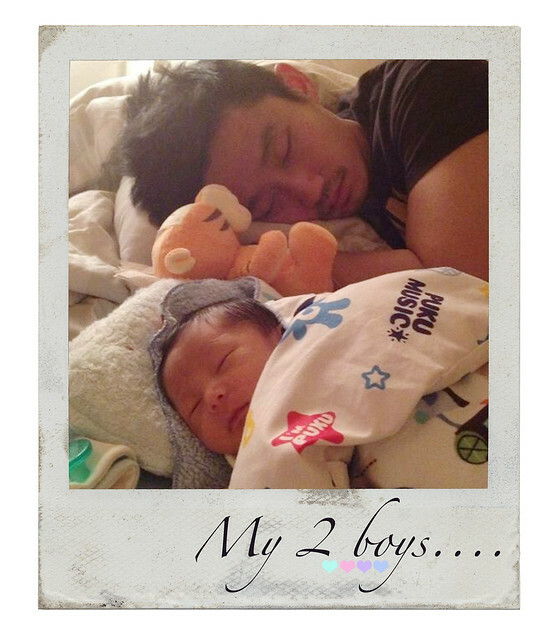 19 Dec 2013 - This photo was taken when both daddy and baby has fallen asleep after a night feed. Although having a c-section made giving birth a breeze, the surgery came with its fair share of pain as well. After the epidural wore off, I was in soooooo much pain. The nurse made me stand up 4 hours after my operation, and when I stood up, I felt like my intestines and internal organs were going to fall out to the floor. I cried and gripped tightly onto my husband's arms. I could only walk 2 steps and had to be helped to the bed again. 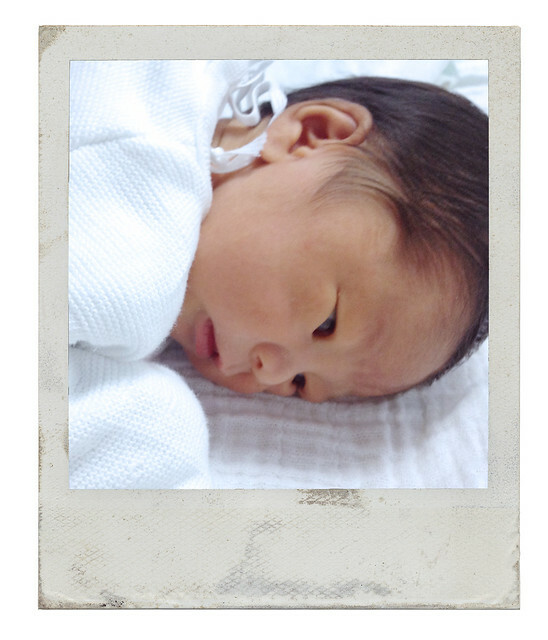 On the second day after c-section, the pain was still very bad. I had 4 dosage of painkillers administered through a catheter. The nurse made me walk 10 steps and the pain was excruciating. The whole time I was shivering in pain. 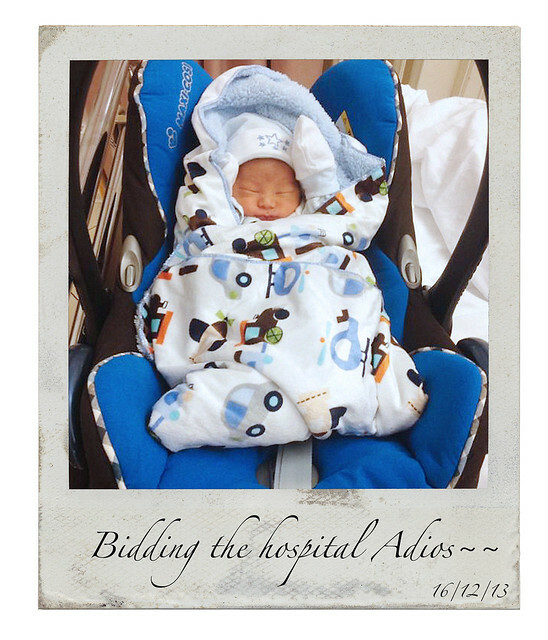 On the third day after c-section, the pain became more tolerable. As the days passed, the pain diminished. The pain is now totally minuscule, it is 7 days after the c-section. I am now only on paracetamol which I try not to consume as I am breastfeeding. Paracetamol is safe for lactating mums though. I wanted to have a c-section thinking that the pain will be less than vaginal birth but now I know giving birth is HARD WORK! It will be painful no matter what!!! But the pain is worth it when I see the smile on my baby's face.